Like a great whiskey, fine wines, and maybe prime beef, they say things get better with age? But do they? I am 41 years old today. At 9:05 pm over four decades ago I came into this world to two parents full of hope and optimism of great things to come. I was their first child born shortly after the the worst of the Vietnam war and before disco, free love and the Brady Bunch. My mom and dad where working folks, attending college when they could and trying to make their place in the world. They were middle class and sure, they had their struggles, they always managed to provide for my brothers and I. Throughout the years I have had more than my fair share of up’s and down’s. But I have lived life to the fullest and while there are many things I regret there are few that I would change. I believe that we are put here to follow a path. Good, bad, or indifferent, what we choose to do, learn and teach on this path is what makes us who we are. As I sit here in my cabin in Alaska thinking back on the last 40+ years I realize this is exactly where I should be. I am doing what I set out to do almost 18 years ago when I first got into mushing. Funny thing is, until now I had not noticed that it has been almost equal time chasing this dream as had not. If I sit here and wonder and plan and calculate and analyze will things change? I doubt it. The only thing I can do is keep following my path and things will come. Good or bad I know that I have lived my life and gained enough experience to meet them head on. So today, like any other, I will follow the advice of someone else that I have come to admire. No its not some great philosopher, poet, preacher, or teacher. It’s the great Ferris Bueller. 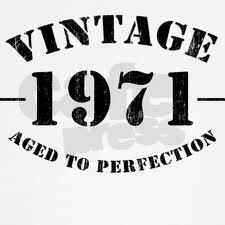 So today I guess I become a bit of a vintage. I just wonder what year it will be before I’m old?